As per last year the event will be taking place on Saturday 19th January 2019 at The Strawberry Bank, Main Road, Meriden, Coventry CV7 7NF. Starting at 6.00 pm the Awards Presentation consists of both presentations for the Northern and Southern section championships, Elgar Shield and the NSA’s perpetual awards plus raffle and entertainment. The awards meal is based on three courses (see previous issue for menu options), and will cost £30.00 per head. Meals must be pre ordered and paid for by 10th January 2019. There is a vegetarian option on the menu, but should you have any special dietary requirements please let Susan McNeil know in good time. 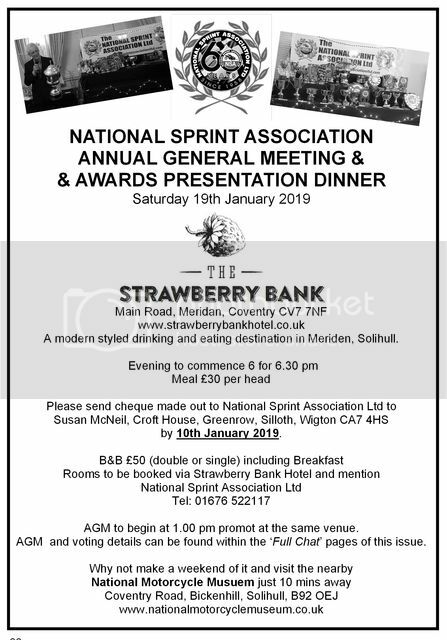 Menu choices and cheques to be sent and made payable to National Sprint Association Ltd (not NSA) to: Susan McNeil, Croft House, Greenrow, West Silloth, Wigton CA7 4HS. Should you have any queries about the Presentation Night please contact Susan on 07721 567716 or e-mail: susanmcneil015@btinternet.com. If you wish to book overnight accommodation, this will be £50.00 per room (single or double) and includes breakfast. This should be booked direct with the hotel as there are a number of rooms reserved for our evening, on 01676 522 117 quoting the National Sprint Association Ltd. Apologies for getting the number wrong in the last issue of the The Sprinter – Jerry.